HARTFORD, Conn. - Jennifer Garcia stood alone before a judge with a stack of legal papers in her hands, answering questions about her personal life. She has acted as her own lawyer in state Family Court in a paternity, child support and visitation case on and off for three years, but representing herself in a courtroom full of strangers still makes her nervous. "Sometimes I get this gut feeling because you never know what the judge is going to say," said the 23-year-old single mother of two from Hartford. Garcia is part of a crush of people who are representing themselves in the nation's civil courts because they can't afford lawyers, who typically charge $200 to $500 an hour. The boom has overwhelmed courts and sparked new efforts to get attorneys to meet what the American Bar Association says is its professional responsibility to offer free legal services to people in need. The increase in self-represented parties stems from a recession that has left fewer people able to afford lawyers and created new waves of foreclosure, debt collection and bankruptcy cases, judges and lawyers say. Judges say self-represented people are slowing down court dockets because they typically don't know what legal points to argue or what motions to file. "There's a crisis in this country," said John Levi, board chairman of Washington, D.C.-based Legal Services Corp., the nation's largest funder of civil legal aid for the poor. "Courthouses are being filled with people just showing up, trying to figure out what their rights are. If you're a low-income person and you have a legal need, it is not easy to get it addressed." Legal Services has a 58-member pro bono task force comprising judges, attorneys, law school deans and other legal experts working on recommendations due out next month on how to get more lawyers to provide free services. At a time of rising demand, LSC has been dealing with funding cuts. Federal government funding for LSC dropped 17 percent to $348 million this year, compared with $420 million in 2010. LSC funds 135 legal aid groups across the country and serves about 900,000 clients a year, but it has to turn away about the same number of people seeking help because of a lack of staff. Less than 20 percent of the legal needs of low-income people are addressed with the help of a private or legal aid lawyer, LSC says. And the number of Americans with incomes at or below 125 percent of the federal poverty level — the income limit for qualifying for legal aid — is expected to reach an all-time high of 66 million this year. A family of four earning 125 percent of the federal poverty level makes about $28,800 a year, government figures show. Several states report high percentages of civil and family cases with at least one self-represented person. In Connecticut, 85 percent of the more than 45,000 family law cases in the 2011 fiscal year had at least one self-represented party. Pro bono work by large law firms has declined in the past few years amid downsizing because of the economy, according to the July and August issue of ALM's The American Lawyer magazine. Average pro bono hours per lawyer in large firms dropped to about 54 last year, a 12 percent decrease from a 2009 peak, the magazine reported. Laurel Bellows, a Chicago attorney and president of the American Bar Association, said the magazine's findings conflict with an increasing pro bono trend that she sees. The ABA has several pro bono programs including one that helps military families. "The need is extraordinary," Bellows said about pro bono services. "You not only have the poverty level community, but also the middle class community. We're really very proud of our lawyers because they're stepping up to the plate and helping more people who need assistance." An ABA survey last year said 75 percent of lawyers believe that people who represent themselves are more likely to lose their cases. Court officials say the recession from 2007 to 2009 and its aftermath sparked new waves of foreclosure, debt collection and bankruptcy cases and left fewer people able to afford a lawyer. Garcia, the Hartford mother, said she can't afford an attorney. After several court appearances, she said she is beginning to feel more comfortable representing herself. State judicial systems have taken steps to deal with self-represented parties, including offering legal forms and help online and setting up court service centers to answer questions. Some states, including Illinois, Georgia and Arkansas, even have pro bono cellphone apps to help lawyers find volunteer opportunities. But state officials are trying to increase pro bono work to help meet demand. New York will become the first state in the country to require lawyers to do pro bono work — 50 hours — as a prerequisite for obtaining a law license starting next year. The state of Washington's Supreme Court in June approved a landmark rule allowing non-lawyers to offer pro bono help in some cases after they receive training. In June, Connecticut Chief Justice Chase T. Rogers urged members of the Connecticut Bar Association to help address what she called her No. 1 concern: the increase in self-represented parties. Judicial officials also held a pro bono summit for lawyers and judges last fall. "Our feeling was that we needed the lawyers, the legal community, to understand the problem. It was getting worse and worse," said Judge William H. Bright Jr., chairman of the Connecticut Judicial Branch's Pro Bono Committee, referring to people representing themselves. Sharonne Martin believes Connecticut should provide public defenders for civil cases like it does for criminal ones. 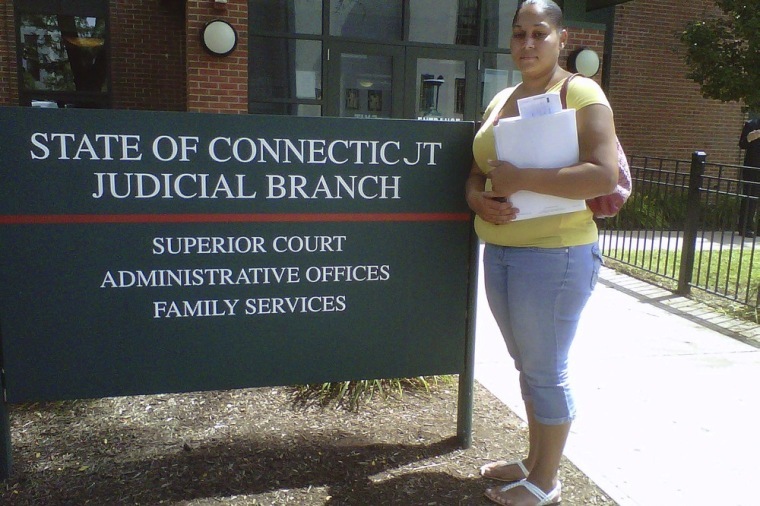 She's been representing herself for two years in Family Court in Hartford and is now fighting an attempt by the father of two of her three children to gain full custody of them. "The pressure is overwhelming," Martin, 28, of New Britain, said about representing herself. "Just keeping up with the paperwork and being organized, it's nerve-racking. It's been hard because ... you're on your own."